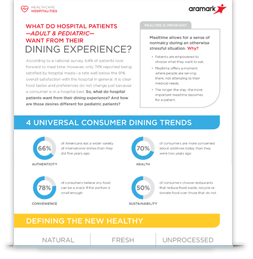 What do hospital patients want from their dining experience? People are dining differently than they did five years ago, and their expectations do not wane during a hospital stay. Don’t let outdated insights about what patients want from their healthcare dining experience affect your satisfaction scores. Discover what hospital patients want in this eye-opening infographic.